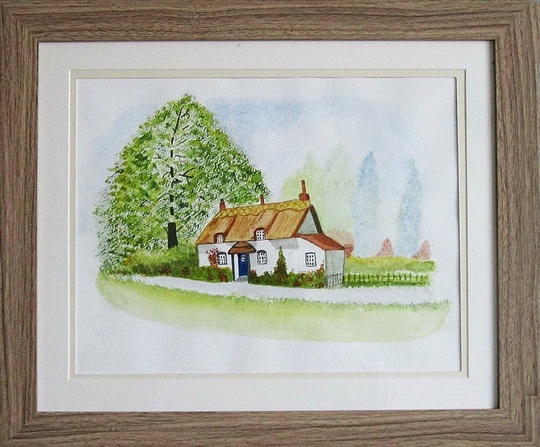 I painted this lovely thatched cottage at my Art Class last week. My husband mounted and framed it yesterday for me. Today the weather is lovely and sunny but extremely windy. That is so pretty, well done! It's a lovely painting well done and husband for the framing. that is very pretty, you are very talented. A beautiful painting beautifully framed. What a very pretty cottage. Lovely painting. Wish I had such talent. On point, very well done! Thanks to all of you for lovely comments. They say practice makes perfect but it seems to take a long time, so I still keep trying. Yesterday I painted a totally different subject a ballerina. That is really good Marjorie. I used to do a lot of painting , but seemed to have no time at present.